Earlier this year, we organised a Nesta Creative Enterprise Train the Trainer workshop in Ho Chi Minh City, Vietnam. This was to share the training methodology behind the Creative Enterprise Toolkit with local trainers, so that they would be able to more effectively deliver workshops to help new creative entrepreneurs set up in business. The outcome was a pool of 20 local trainers ready to use the Toolkit in their own training. ADC Academy, a local creative hub specialising in visual and graphic design, organised the first subsequent Training for Creative Entrepreneurs. We spoke to Ta Minh Trai, co-founder of ADC, about the experience and how they intend to build upon it in the future. Could you please tell us a bit about the ADC Academy? What is your mission and key activities? ADC Academy’s mission is to enhance Vietnamese people’s access to arts, design and creativity initiatives. We want to create a high quality education platform for designers and startups in creative sectors. We have a number of long term training programmes focusing on visual art and graphic design, while our short team training focuses on developing creative skills and inspiring people’s curiosity and creativity. In Vietnam we are also the only hub that provides training on design thinking, and courses about soft skills such as project management, leadership & teamwork, communications and creative entrepreneurship. What is the context of business skills training for creative people in Vietnam? Currently, there are many courses for young people on starting a business (but) training for creative entrepreneurs is a new concept. When they want to start a business, creative people often have to gather information and knowledge from various sources, most of which come from economists, rather than creative entrepreneurs. 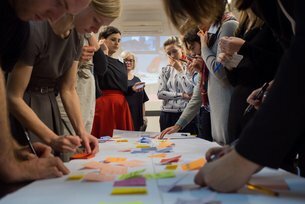 Therefore, the Nesta Training [which is specifically designed for creative businesses] is an interesting and helpful starting point for young people who are passionate about creative ideas and want to start a business. Creative entrepreneurs get their certificates. This is the first Nesta creative enterprise training facilitated by local trainers. Could you tell us more about how you engaged the trainers, and what were the results? We developed a very close network amongst trainers during the programme, so it has been not been difficult to connect with them again. Most trainers are very enthusiastic about the idea and willing to provide support on developing the schedule and delivering various sessions. With the conclusion of the Nesta Train the Trainer course, we got small financial support from the British Council to organise Nesta Training for Creative Entrepreneurs. We were lucky to be able to engage not one but seven trainers, who come from different backgrounds i.e. marketing, finance, investment, design. This made the course a very comprehensive proposition that included a broad range of case studies and practical information about different sectors. Could you tell us about the participants and their businesses? Most participants are either working or studying in creative sectors, such as design, fashion design, interior design, architecture, graphic design. They all want to set up a business but do not know where to start. We organised two talks on starting your creative business to share information on the training before it started. The talks were well attended, and after the talk we managed to reach many potential new training participants. What were participants’ reactions and comments about the training, and what do they think of the Toolkit? Most feedback was very positive. Participants said that the training offered them a lot of new knowledge and a whole picture, and help them to visualise how to start their businesses. However, for some people, receiving a quite a lot of information and knowledge in a very short time is a challenge. About the Nesta Toolkit, I think it is an efficient tool that helps participants to re-organise and re-structure knowledge they receive. The design is quite simple, and the content is short, precise and easy to understand, with many visuals and images. All of these make the Toolkit a very useful tool for creative entrepreneurs. It has been interesting for us to see that Nesta training is now run by ADC and embedded in your hub’s work. How do you plan to take it forward? This is the first time we organised training on creative startups and it was quite different from courses about design and creativity at ADC Academy. As it offered new content, in the beginning it was quite challenging for our students to get through it. However, the training proved to be very useful in the end. When we founded ADC Academy, we always wanted to become a creative hub providing training to creative entrepreneurs. We will embed this Nesta training in our 2 year training programme at ADC 2014 - 2016, and will offer our students 3 months of business coaching after they graduate. Besides the long term training programme, we are also running short courses every three months. Nesta training for creative entrepreneurs therefore could be one of them and happen on a regular basis this year and in the following years. Access the Nesta Creative Enterprise Toolkits here. Presenting recent reports and mapping activity of creative hubs in Vietnam, and highlighting the potential impact, operating models and policy surrounding them. We're looking for a UK based producer to lead on the content and delivery of a two day event for creative hubs in Vietnam.